A California state senator just introduced legislation that would ban BPA from bottles and cans intended for children 3 and younger. March 2, 2009, 4:15 p.m. Fellow MNN blogger Jen Savedge recently wrote about how even low levels of bisphenol-A (BPA), a chemical compound found in many food and drink containers, could be harmful for babies’ health. Luckily, we’re beginning to see some government action on this issue — at least in California. California State Senator Pavley just introduced legislation that would ban BPA from bottles and cans intended for children 3 and younger. Called The Toxin-Free Toddlers and Babies Act (S.B. 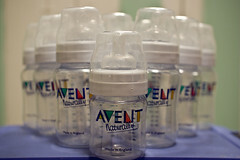 797), this new bill targets baby bottles and children’s cups with more than 0.1 parts per billion of BPA. If passed, the bill would prohibit the manufacture, sale or distribution of such BPA-containing containers. You don’t have to wait to see what happens with the legislation to take action against BPA, however. Find out how you can avoid BPA in your day to day life, and what reusable water bottles are BPA-free.